Like a tattered quilt, snow covered what remained of the north end of Halifax. Debris poked up through the white like blackened knees. Smoke curled up to the sky, even though the blizzard extinguished the most aggressive of the flames. 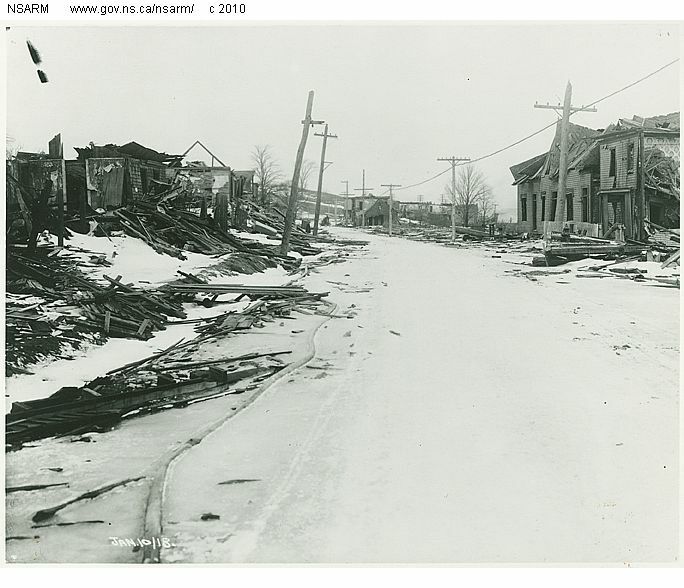 Campbell Road (now Barrington Street) looking north to the area which experienced the most dreadful devastation in the December 8, 1917 explosion in Halifax, Nova Scotia. Such was the scene when a young soldier heard a baby crying. Searching out the source of the noise, Benjamin Henneberry found a toddler tucked beneath the ashpan of a stove. The young girl had minor injuries and burns, but had miraculously survived both the destruction of her home and the blizzard which hit the day after the explosion. Though Private Henneberry was convinced the girl was his, while in the hospital, the toddler called out to a passing aunt. That aunt identified her as Annie Liggins, and if not for that accidental meeting, she might have been raised as Olive Henneberry. Unfortunately for Henneberry, none of his family survived the explosion and Annie was returned to her family. The miraculous part of the story: when the Mont Blanc exploded into a million pieces and her house collapsed, Annie was thrown into the nearby ashpan as her house fell down around her, killing her mother and brother. Even more amazing, the leftover heat from the stove kept Annie from freezing during the blizzard. Annie’s story made her a journalist’s darling. Newspapers ran with it: Ashpan Annie, the miracle baby. That she survived with only minor burns from the stove is best fitted to Ripley’s Believe it or Not. Ashpan Annie’s father was serving in France when the explosion occurred. He eventually returned and remarried. Annie grew up. Married. Had children, grandchildren, and great-grandchildren. This weekend, at 95 years young, Ashpan Annie died, sometime between Friday night and Saturday morning, an old lady warm in her bed. In fact, she resided at the Berkeley, one of the finer residential homes for the senior set, the Cadillac of special care facilities. Survivors of the Halifax explosion are passing on, given that it has been almost 93 years since the disaster, which killed nearly 2,000 people, literally in the blink of an eye. Hearing stories of survival from those who experienced one of the world’s largest human-made disasters is a privilege that will soon be gone. All that will be left are books and recordings of those willing to remember, like Janet Kitz’s extensive research or the University of Kings College’s slideshow of Ashpan Annie’s story. Click here. Rest in peace Annie Liggins Welsh, probably with her family once again for the first time in 93 years. Watching a movie about the Halifax explosion and found your story of Ashpan Annie. So glad to know she lived a long and happy life after surviving such a tragedy. My grandfather, a firemen in Truro, went to Halifax after the explosion to lend aid. I don’t remember his stories, but have heard them repeated by my Aunts and Uncles. While visiting Canada from New Zealand recently I saw a television item regarding the death of Annie Liggins and as my family surname was Liggins I was interested to follow up this item and found out more about Annie. What a wonderful story. I am so glad she lived to such a ripe old age.